I'm on somewhat of a decorating spree at the moment, so the arrival of How They Decorated: Inspiration from Great Women of the Twentieth Century has come at the perfect time! This book captures the individual approaches of sixteen icons of style: Lady Diana Cooper, Evangeline Bruce, Louise de Vilmorin, Sybil Connolly, Hélène Rochas, Gabrielle van Zuylen, Mona von Bismarck, Pauline de Rothschild, Babe Paley, Elsa Schiaparelli, Fleur Cowles, Pauline Trigère, Bunny Mellon, Dominique de Menil, Georgia O’Keeffe, and Lesley Blanch. Author P. Gaye Tapp analyzes each of her subjects’ refined way of living, how each embellished her residences (or left them elegantly stark), and the long-lasting effects on today’s generation of designers and connoisseurs of beauty. 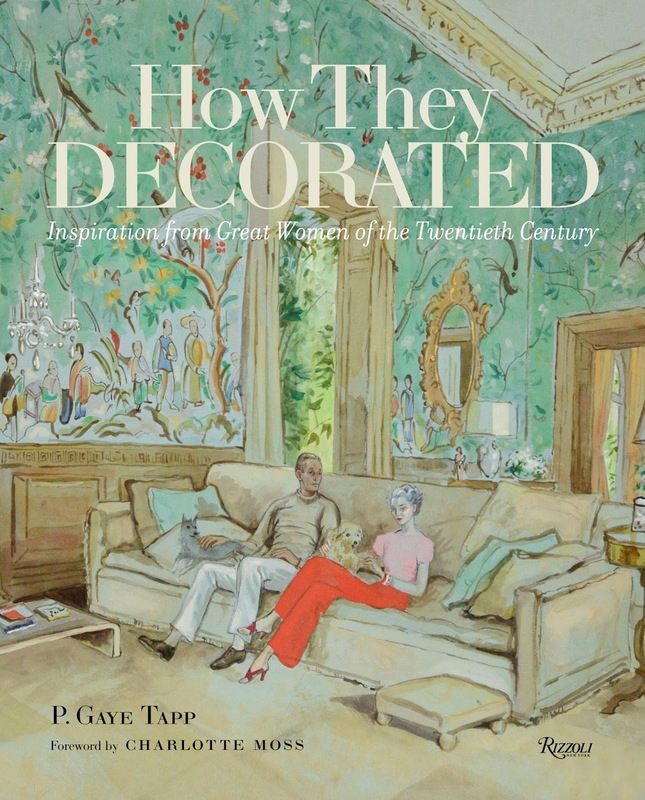 The book is presented in four sections that describe the aesthetic approaches that the women took in decorating their abodes: “The Fashionably Chic”, “The Unconventional Eye”, “In the Grand Manner”, and “Legacy Style”. 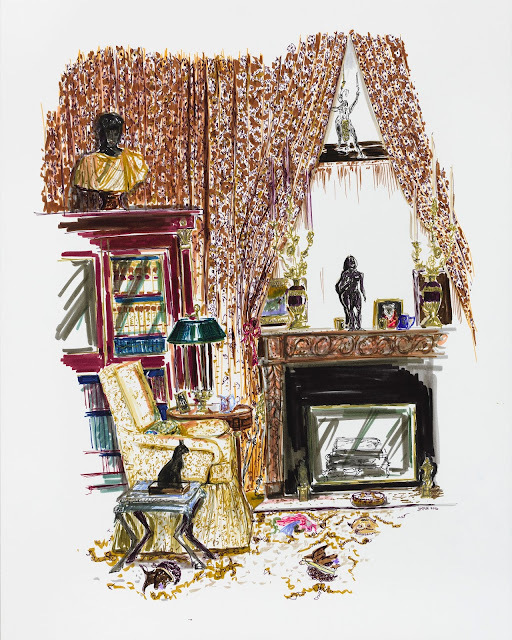 Each interior illustrates the crucial aspect of the woman’s definitive taste. 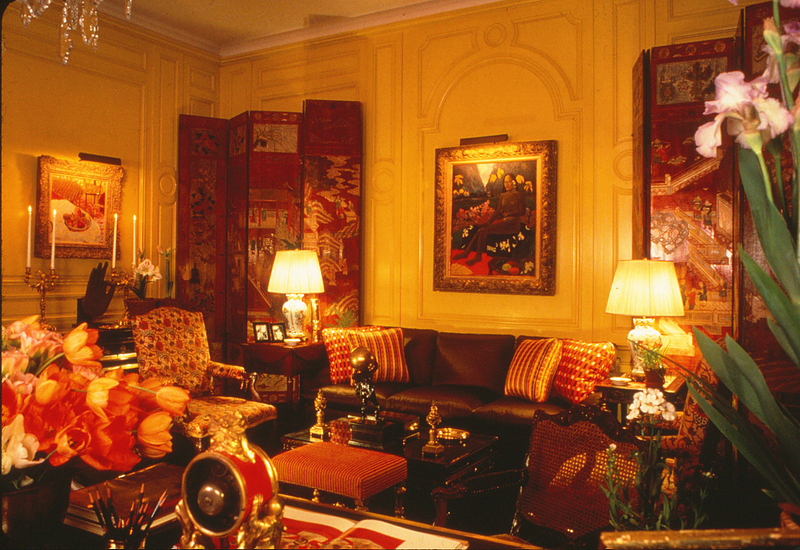 Some worked closely with decorating legends such as John Fowler, Albert Hadley, Billy Baldwin, Syrie Maugham, and Jean-Michel Frank. Others took to the task of decorating single-handedly—like Pauline Trigère, Sybil Connolly, and Fleur Cowles. The interiors of these trendsetting women defied their time and inspire and delight to this day. In How They Decorated, one can learn from the most notable style muses of the last century. Thanks to Rizzoli for a review copy of this fantastic book! Good news fashion fans, Theresa May's navy blue LK Bennett dress which features in her amazing Vogue shoot is available! 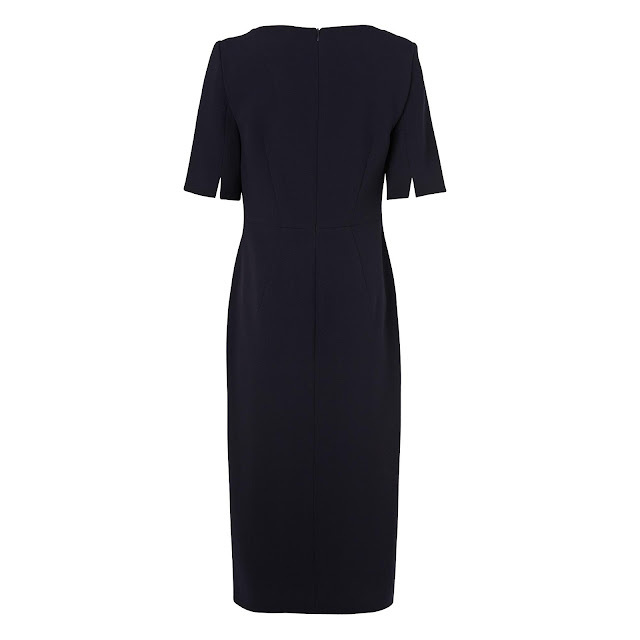 The Saskia Sloane blue dress has a curved seam detail with capped sleeves and a daring thigh cut. 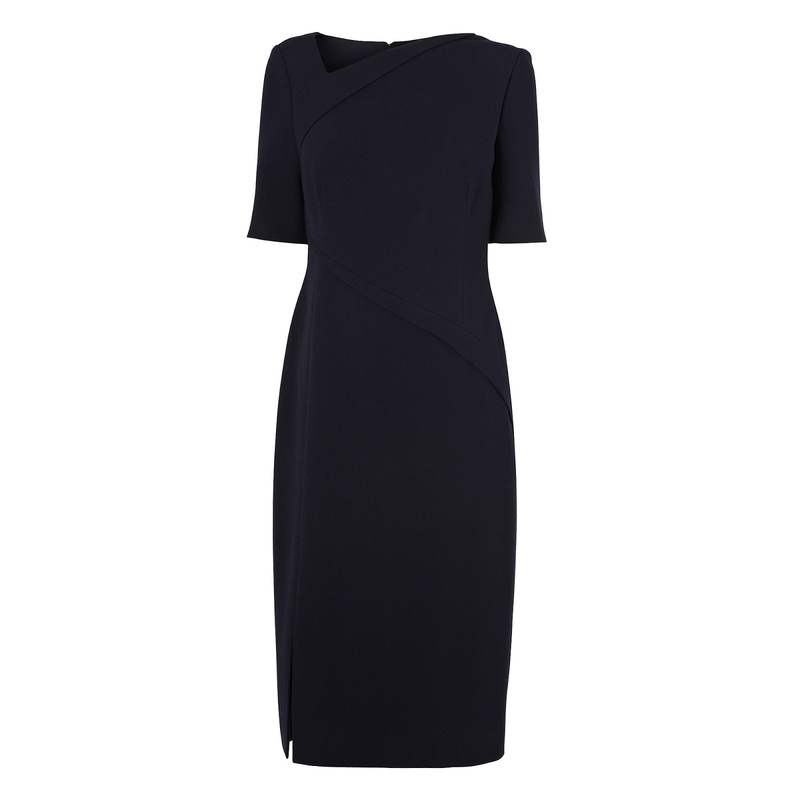 It is mid length and is the perfect dress to effortlessly take you from day to night. Accessorise with a daring pair of kitten heels and you are good to go! 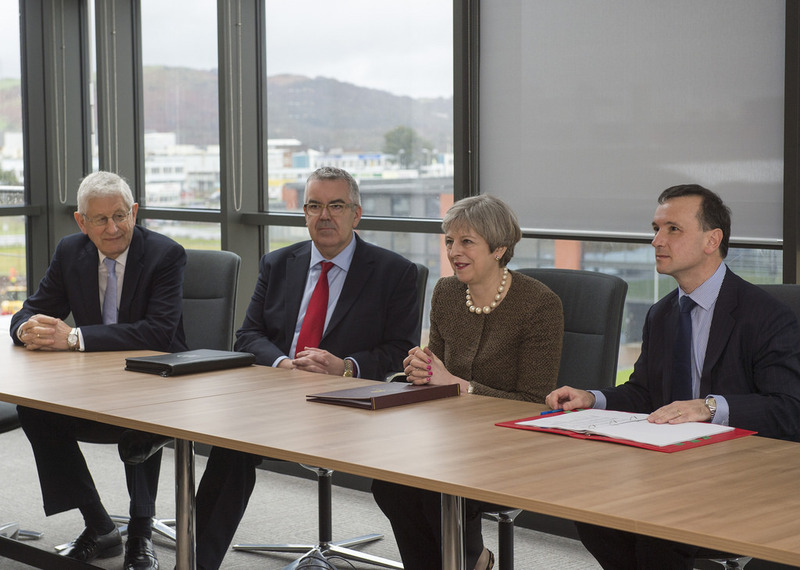 The Prime Minister started her week back in Wales, with a visit to Swansea to sign the City Deal for the Swansea Bay Region at the Liberty Stadium. May met with the First Minister and business leaders (including one of my friends!) at the event. 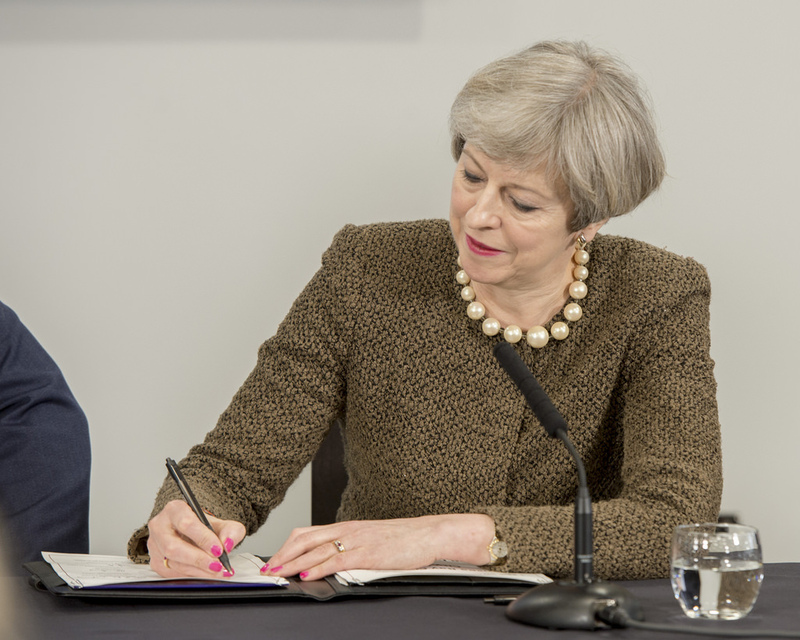 For the signing, the PM wore a brown tweed jacket, black trousers, an oversized pearl bead necklace and the leopard Cocktail loafers from Russell & Bromley. 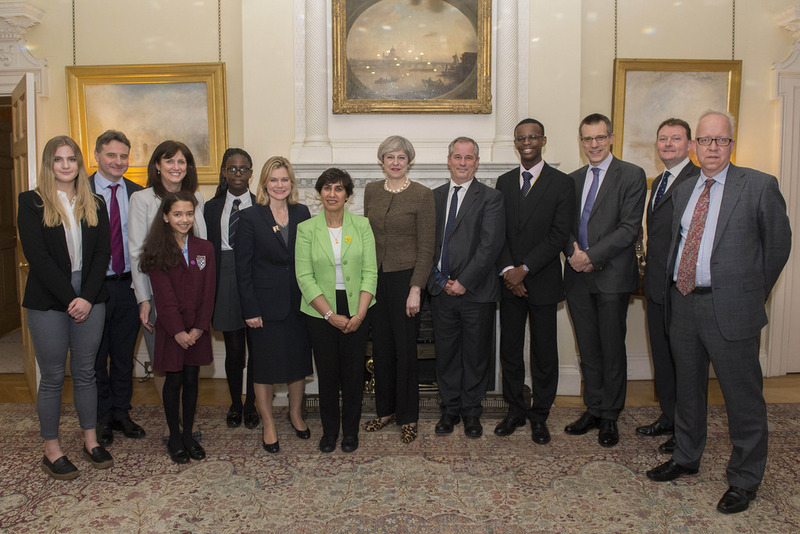 On her return to London, Theresa May hosted a reception for guests from schools, universities and for leading figures in education. The Prime Minister thanked attendees for the vital work they are doing to encourage social mobility and provide a good education for every child. On Wednesday, Theresa May attended the weekly Prime Minister Question session. She wore her tweed jacket from DvF, navy skirt, Daniel Blake coat and the Vivacious pumps from Russell & Bromley. 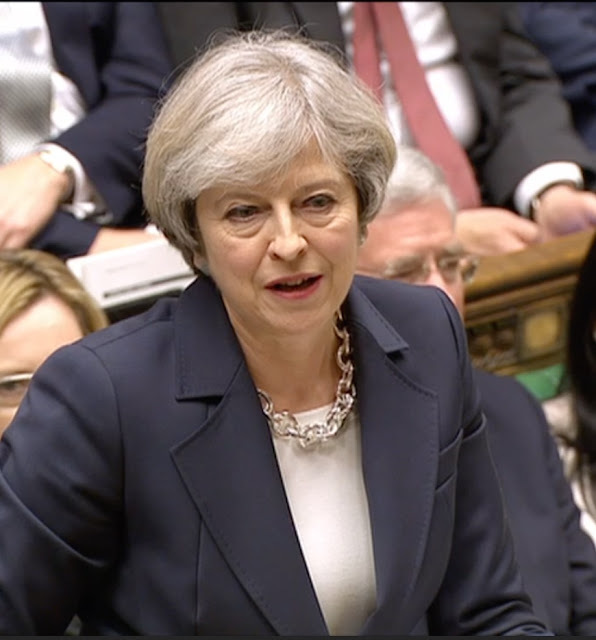 On Thursday, the Prime Minister addressed Parliament and wore an appropriately somber black and white outfit. She accessorised with the familiar Amanda Wakeley silver chain necklace. On Friday, Theresa May was spotted in her Maidenhead constituency attending the opening of a new McDonald's! Thanks to MaidenheadMum for the tip. This week has been a particularly tough one, and for many of us, one which we won't forget. It's a privilege that my work takes me to Westminster, and working in the world's oldest Parliament last year was a wonderful experience. Parliament has brought me life-long friends, broadened my knowledge and enabled me to combine my love of digital and public service. I was in Westminster on Wednesday, and thankful that my work in Parliament concluded just before the awful attack. Caught up in the aftermath of the attack, people from all backgrounds and professions worked to help each other and provide some sense of reassurance. I won't forget the somber faces of those walking towards me, evacuated from government buildings and their offices in Whitehall. I also won't forget the hush that descended in Westminster's back streets, the eerie quiet filling the area. We won't forget those who died in the awful attack, and the bravery of our police, security services, parliamentary members, staffers and members of the public. 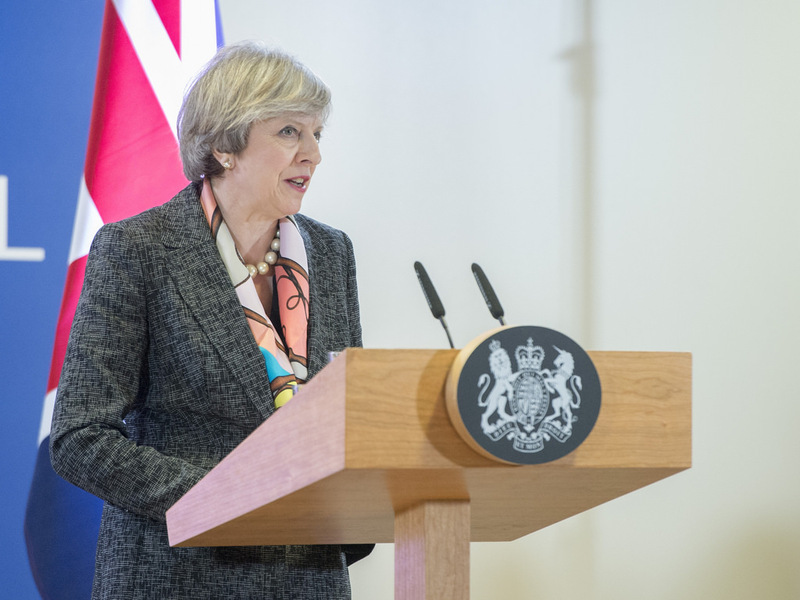 It is inevitable that things will change because of the events in Westminster, but as the Prime Minister said, we will all move forward together. Never giving in to terror. And never allowing the voices of hate and evil to drive us apart. We know the Parisians are considered to be completely chic, but how can non-Parisians take some of their sense of style and implement it into our wardrobes? Legendary model and designer Ines De La Fressange is solving this problem with her new book, the Parisian Chic Look Book. Packed with tips and tricks on how to dress for situations, this shiny gold volume details the key pieces you need to own. 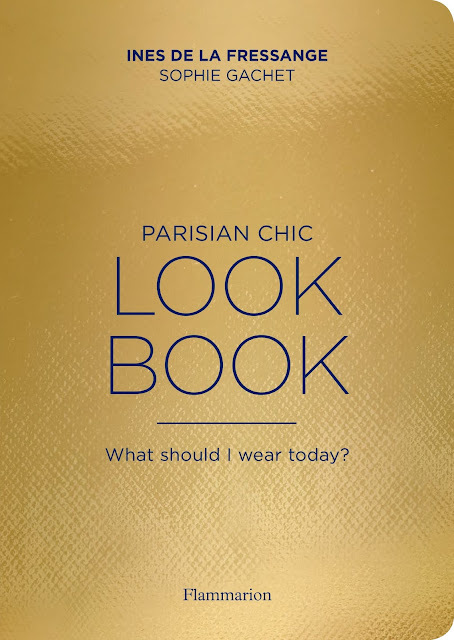 From black jeans to a navy blazer, jeweled flats to simple tees, this book can help you locate the basics whilst adding that hint of Parisian glamour. My favourite looks are the ones which are classic- a clean silhouette, jazzed up with a touch of sparkle or a strong accessory. Whilst some of these looks I wouldn't personally wear (e.g. a jumpsuit on a shopping trip,) this book is a fun one to get those fashion juices flowing. Ines de la Fressange © Alessandra d'Urso. One word: wow. 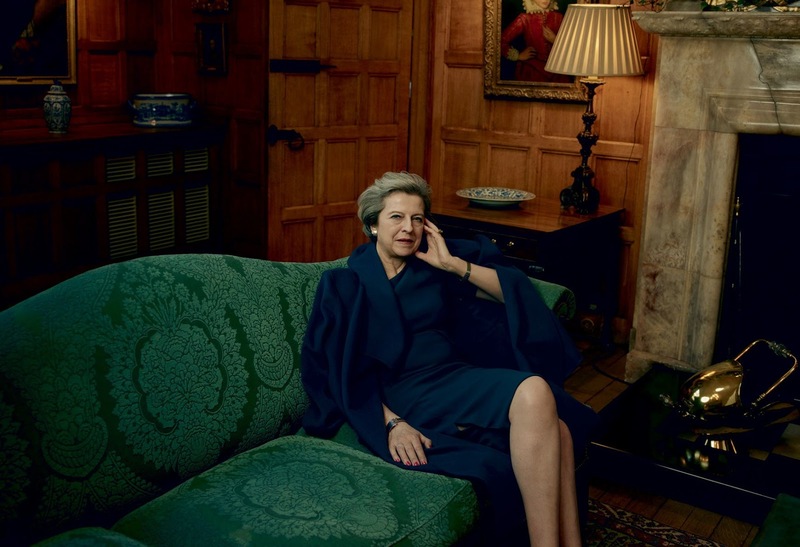 Annie Leibovitz's portraits of Prime Minister Theresa May were released to a flurry of anticipation, excitement and delight this afternoon- and what a set they are! 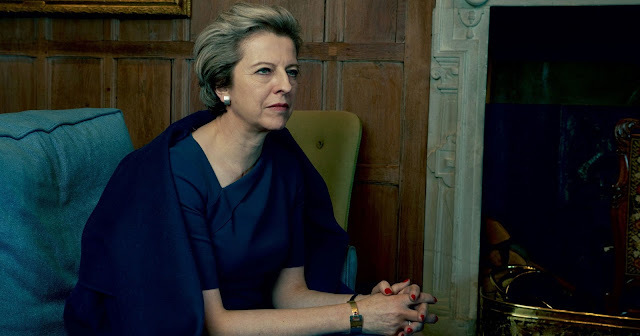 Pictured at Chequers, the traditional country retreat of the British Prime Minister, Theresa May has been photographed wearing a navy dress and coat by LK Bennett in one of manor's many reception rooms. The second image sees her look direct to camera, but it is perhaps the third image which is the most special (and my favourite.) On a country walk with husband Philip, the Prime Minister looks carefree - and uber chic in an Egg coat and a Sine for Egg sweater. Her black patent croc over the knee boots from Russell & Bromley also make a welcome reappearance. There was much speculation of the photoshoot when it was announced in January. Was the Prime Minister, so rightly focused on Brexit negotiations and legislation sensible to be photographed for the world's biggest selling fashion magazine? As I argued at the time, this was a bold and smart move by Number 10, and one which is important to sell Britain to the world. May has embraced this responsibility, and is using her love of fashion and strong sense of self to show how Great the UK is. 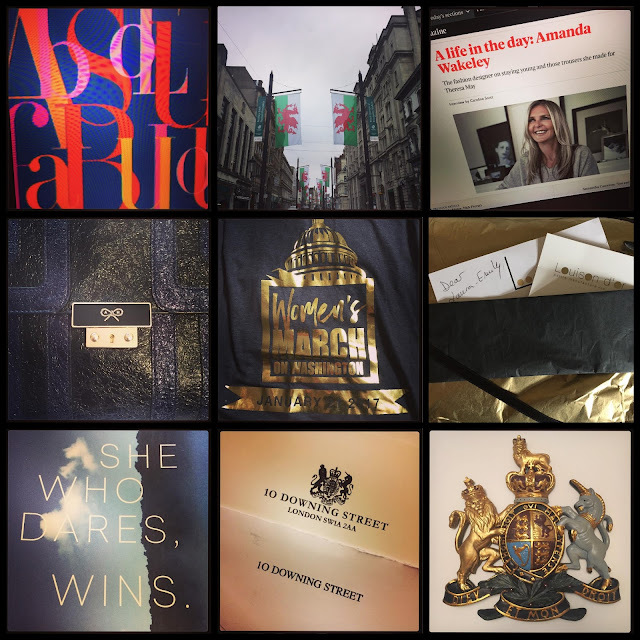 From wearing high street tailoring to spotlighting under the radar brands, May is a true champion for Great Britain and the creative forces across our nation. Vogue is no stranger to placing politically associated figures on its cover and amongst its pages. From Hillary Clinton to Michelle Obama, this is one of the most anticipated issues of the magazine- and one which will go down in history as a great cultural success. You can read my comments for Mail Online about Theresa May's choice of clothes for this feature here. 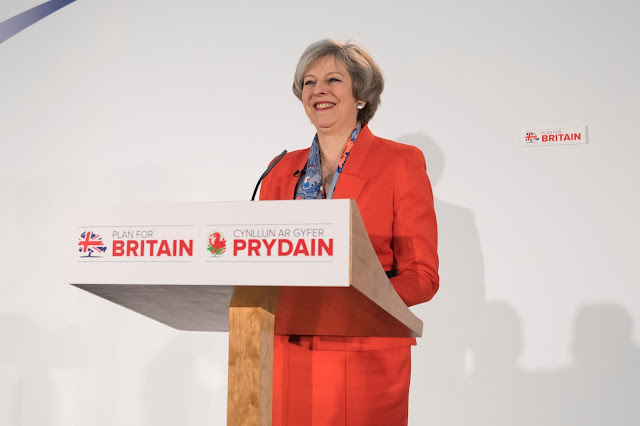 Prime Minister Theresa May was in Cardiff on Friday, addressing delegates at the Conservative Party Spring Conference and Forum. I was lucky enough to go along and listen to her speech in person. Whilst security was understandably tight, I managed to be at the front of the stage - as this sort of arty picture attests! This was my first time at a political conference and it was good to experience the set-up, structure and general way of working. It was also pretty cool to see the PM again and my prediction of her red Amanda Wakeley suit was right! 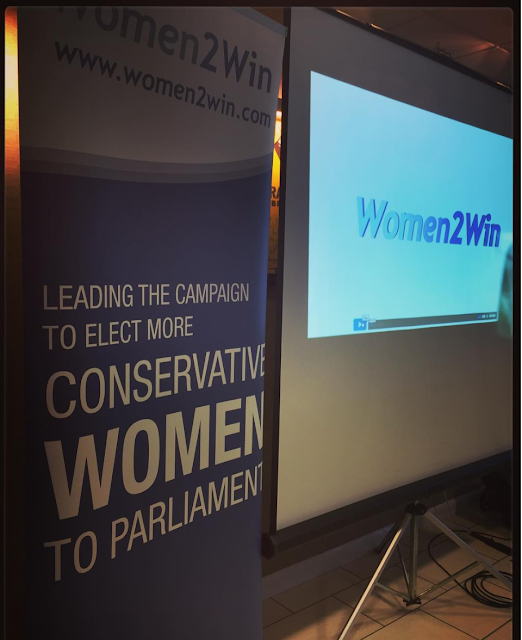 I also had a great time attending a Women 2 Win event in the event, listening to MPs and AMs talk about their inspiring and determined journeys to elected office. You can watch the PM's speech below- and thanks to Matthew Horwood for use of these awesome pictures! It's been another busy and unpredictable week for the Prime Minister. 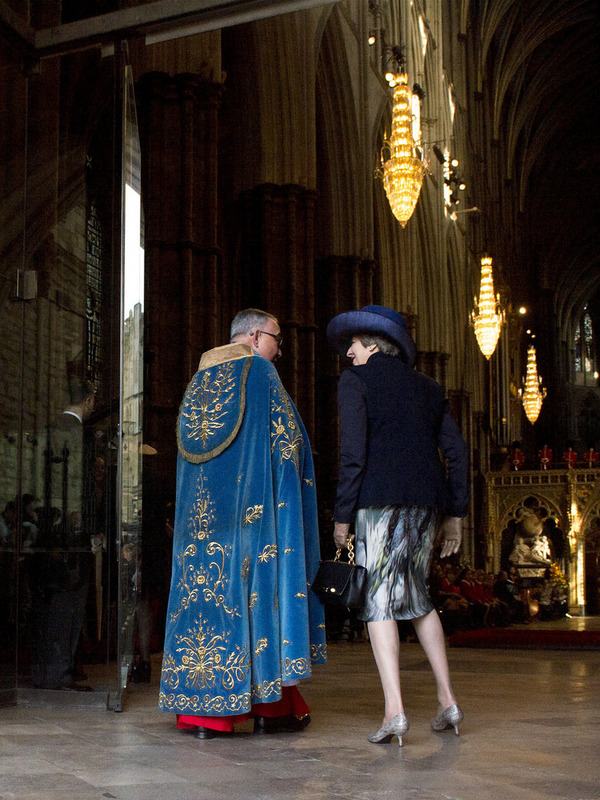 On Monday, Theresa May attended the Commonwealth Day service at Westminster Abbey in London. The PM turned to a classic navy look for the service, wearing an Aztec print Amanda Wakeley dress, navy blazer, and a chic hat by Liz Felix. Her snakeskin kitten heels are old favourites from Russell & Bromley, as is her Amanda Wakeley bag. On Tuesday, the PM delivered a statement on the recent European Council meeting in Parliament. She again wore some old favourites, this time a brown fleck jacket, black trousers and the leopard Frame flats from Russell & Bromley. 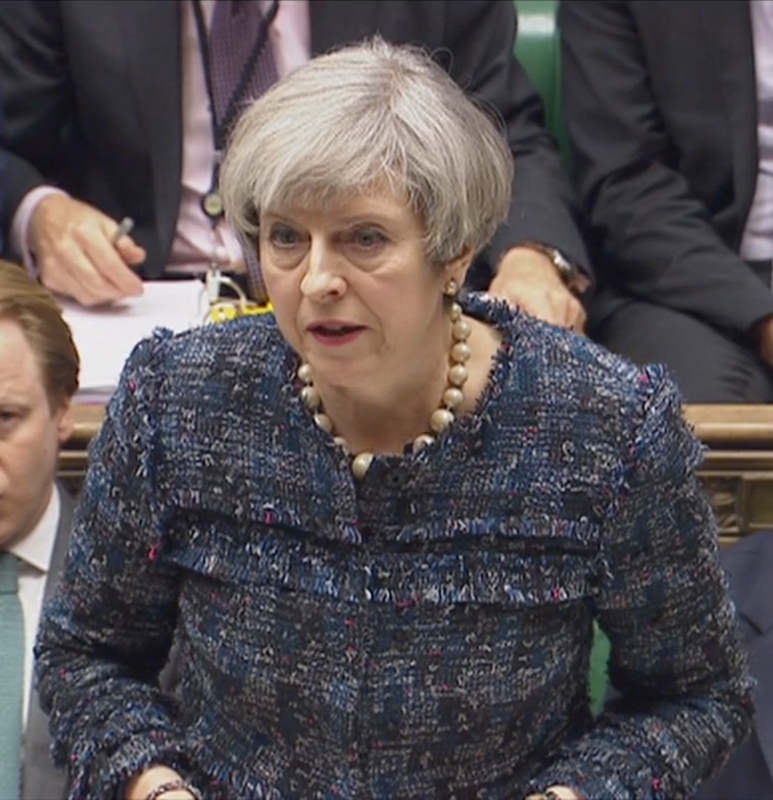 On Wednesday, it was time for Prime Minister's Questions, and the familiar navy Escada suit made a reappearance. The chunky Amanda Wakeley chain necklace was the perfect accessory, as was a pair of leopard print kitten heels from LK Bennett. 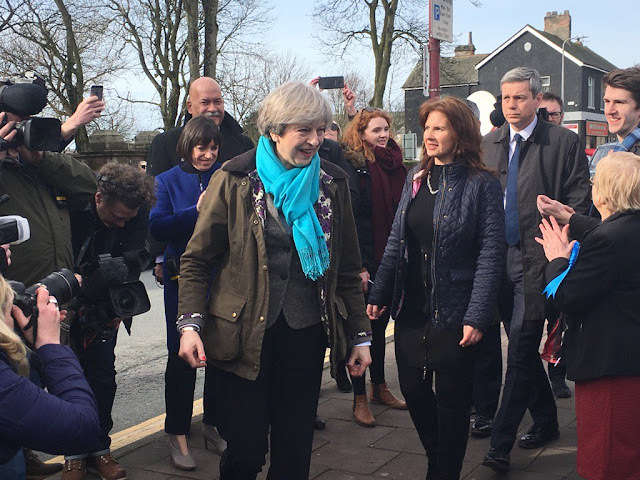 The PM also wore her new camel coat- we're still trying to track this down! 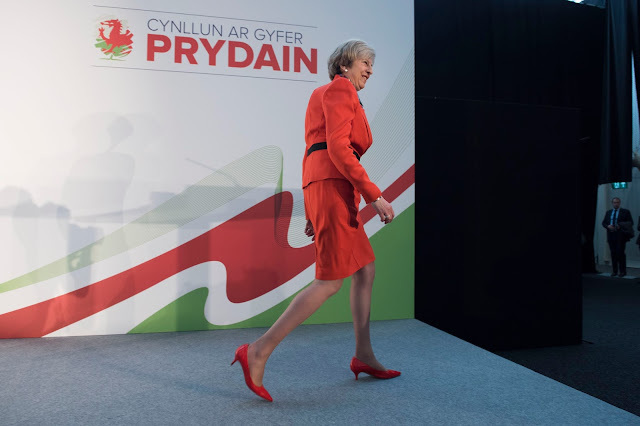 On Friday, Theresa May came to my home turf of Cardiff to address Welsh Conservatives at their spring conference. I predicted that she would wear red- and I wasn't wrong! The famous red Amanda Wakeley suit, Hermes scarf and red patent kitten heels from LK Bennett were her outfit of choice. She kept warm against the Welsh weather with her camel coat and accessorised with a baby blue bag from LK Bennett. 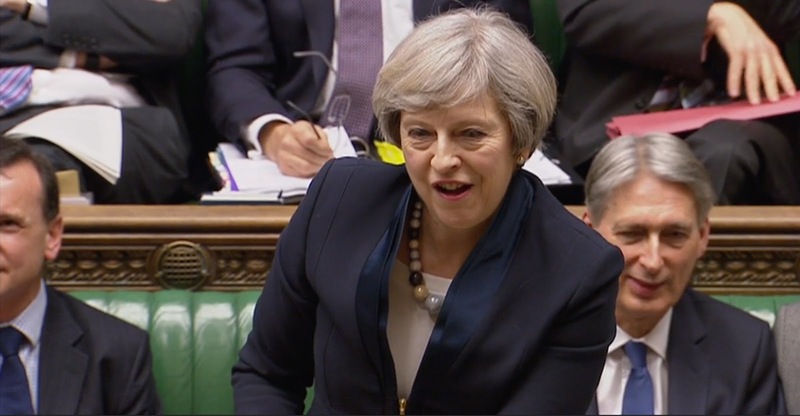 What makes Theresa May such a fascinating character is that we don't know much about her. 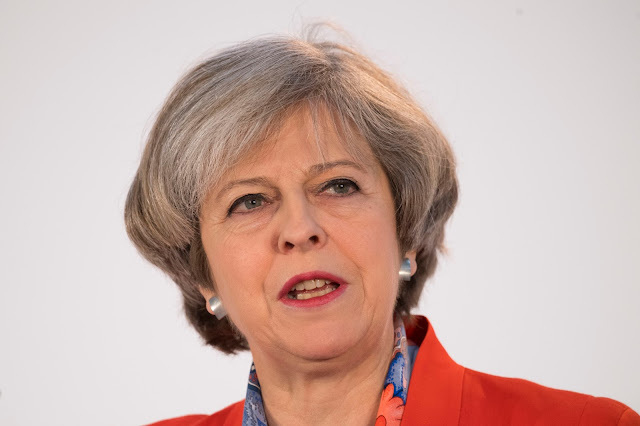 From her upbringing as the daughter a vicar, to the longest serving (and most successful) Home Secretary, Theresa May is a leader we are intrigued by. This new biography released earlier this month by Biteback and written by award-winning political journalist Rosa Prince, aims to educate us about our Prime Minister, and casts the light on the personal character behind the professional image. I enjoyed finding out more about May's time as a local councillor, her attempts to be selected as a parliamentary candidate and her early days as the MP for Maidenhead. It was also great to read more about her role as Conservative Party Chairman and the various positions she held in the Shadow Cabinet. Perhaps what is most impressive is her record as Home Secretary. 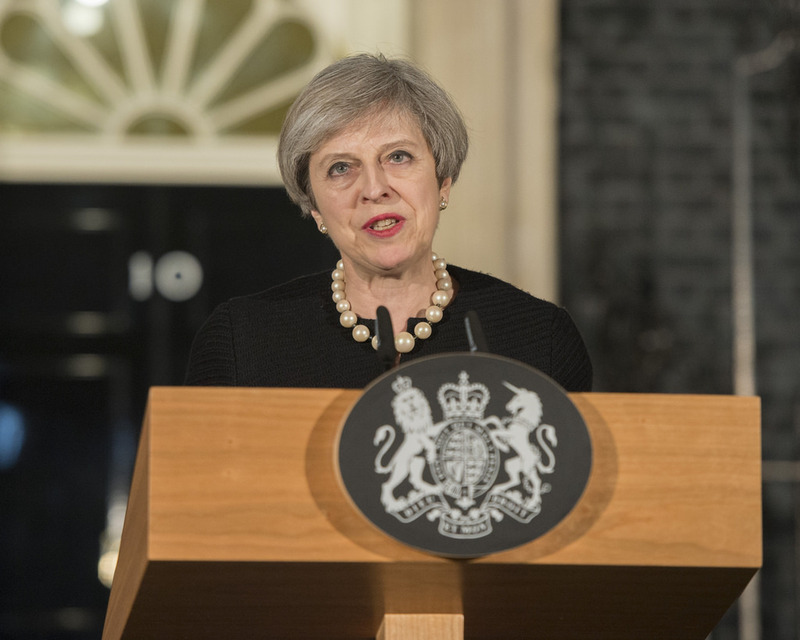 From tackling modern slavery to the fight against terror, it's evident that May is a tough character, cemented in her principles and duty to do her very best. May has frequently stated that politics is not a game, and from this book you understand that she is truly committed to public service and positively effecting the lives of others. 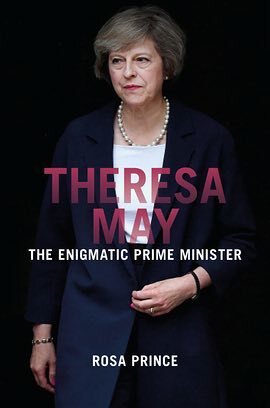 Whilst there are no shocking revelations or ultra new information in this biography, the interviews with various parliamentary colleagues and party members does provide a warm and fascinating insight into May's personal and professional life. And, unsurprisingly, I really enjoyed the anecdotes about May's love of fashion! This is a great book to read if you want to find out more about our Prime Minister, and considering the quick turn-around that Prince had to meet, the level of research and detail is impressive. A must-read for any politics fan! 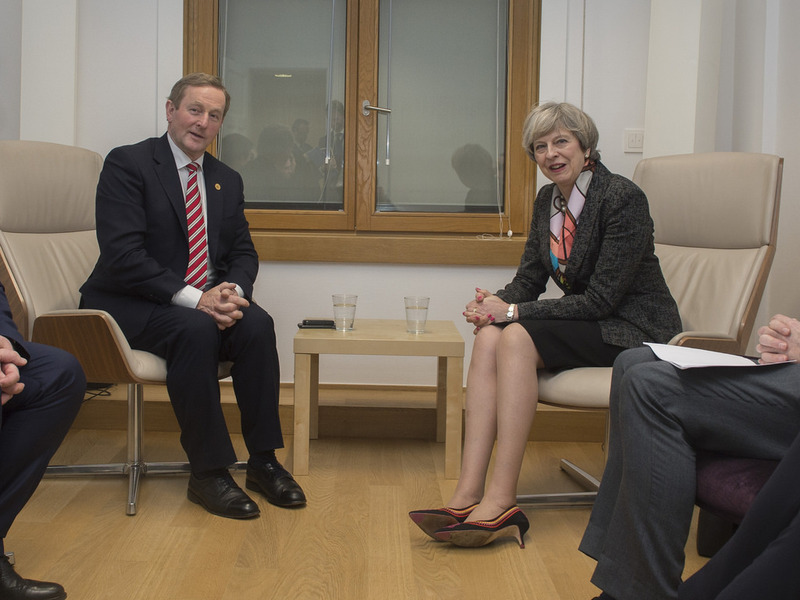 Budget day and a trip to Brussels- this one was a busy one for our Prime Minister. 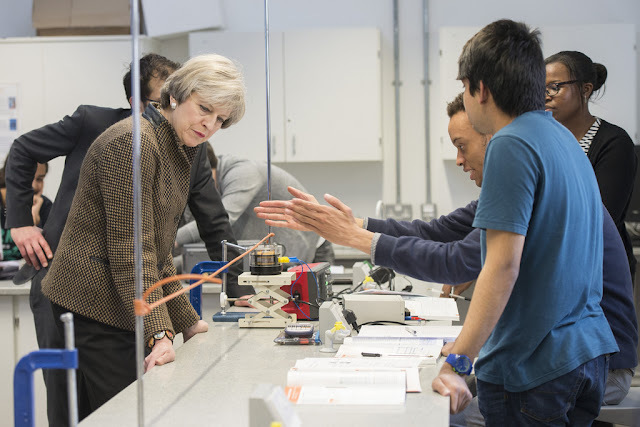 On Monday, Theresa May visited the King's College London Mathematics School to announce more than half a billion pounds of investment to create new free schools, including grammars, and refurbish existing school buildings. Chancellor Philip Hammond's Budget included £320 million to help fund up to 140 new schools, creating more than 70,000 new places. 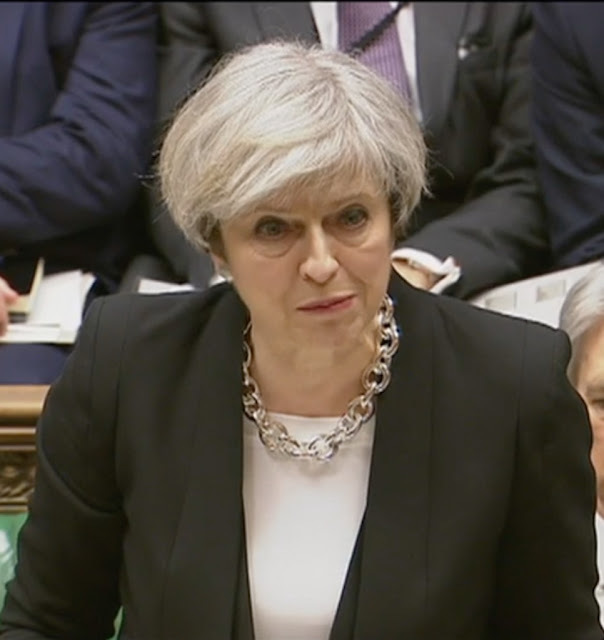 On her visit to King's, the PM wore a stylish brown weave blazer, black trousers and accessorised with an oversized necklace. On Wednesday, the Prime Minister attended Prime Minister's Questions and also the Budget. Wearing our favourite navy suit, May chose the Twister block heels, baby blue bag from LK Bennett and a new camel overcoat for her day in the Commons. 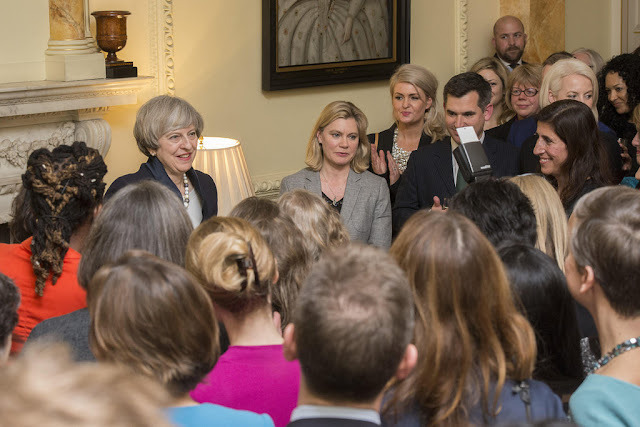 In the evening, the PM hosted an International Women's Day reception at Downing Street. On Thursday, the Prime Minister attended the dedication and unveiling of the Iraq and Afghanistan Memorial in Whitehall. Wearing a black Amanda Wakeley dress, grey Escada blazer, Liz Felix hat, Amanda Wakeley bag and the Saucy pumps from Russell & Bromley, May paid her respects alongside members of the Royal Family and other dignitaries. From here, May headed to a European Council meeting in Brussels. She switched her shoes, opting for the Caroline Issa x LK Bennett embroidered pumps and the Coup de Fouet Hermes scarf. 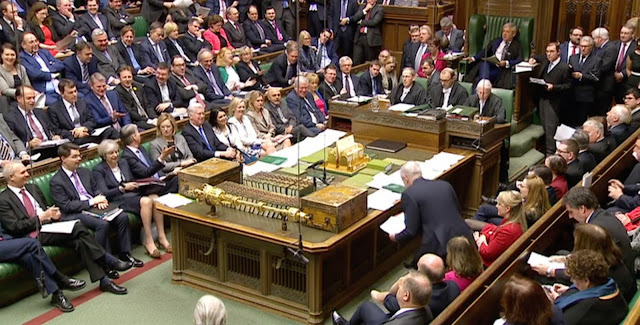 We were all thrown into a bit of a frenzy this week when Theresa May debuted a new scarf at the despatch box during Prime Minister's Questions. 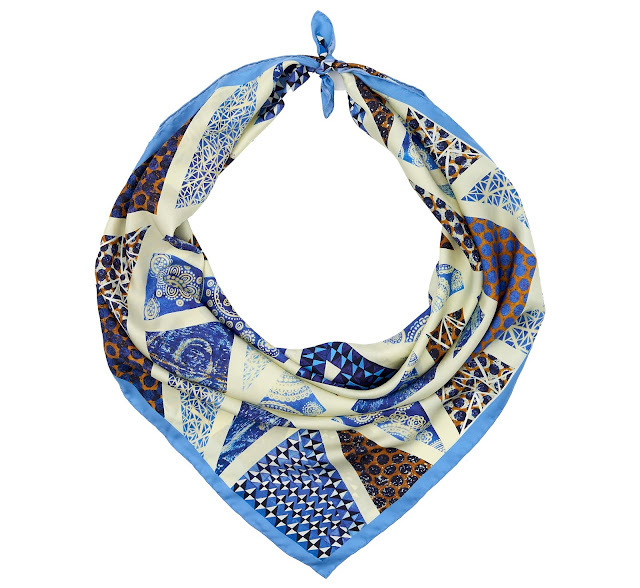 Gorgeously geometric, the scarf featured blue hued triangles, the colouring reminiscent of Spode pottery, with a similarity to leopard print thrown in! 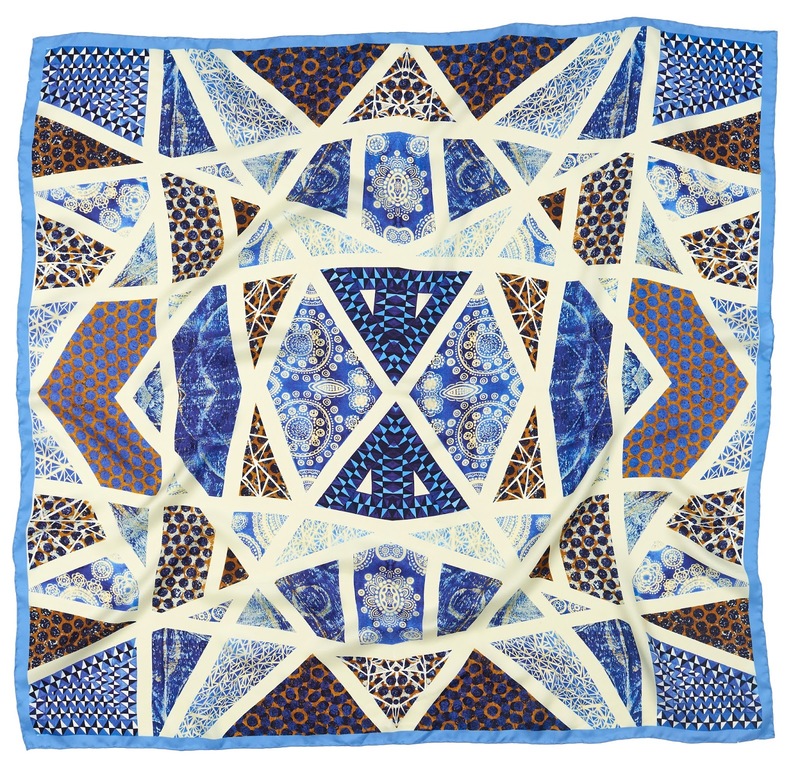 Lots of readers contacted me to find out who designed May's beautiful scarf, and I can reveal that the creation is by Megan Ferris! Megan is a printed textiles student currently studying at Winchester School of Art in her third year. She adopts an experimental approach to her work, using a wide range of materials to create an interesting array of marks. Megan has recently taken an interest in surrealism and has been creating weird and wonderful designs using collage and painterly patterns for her latest project "Dreams & Hallucinations", which conveys a variety of juxtaposed objects and animals. May's scarf is the Tavira design, made from silk twill and 12.5mm with hand rolled edges. Made in England, Tavira is inspired by the architecture and azulejo tiles from the town of Tavira, Portugal. The decorative hand painted tiles were the stimulus for this design, which is formed from an array of marks using a range of materials. 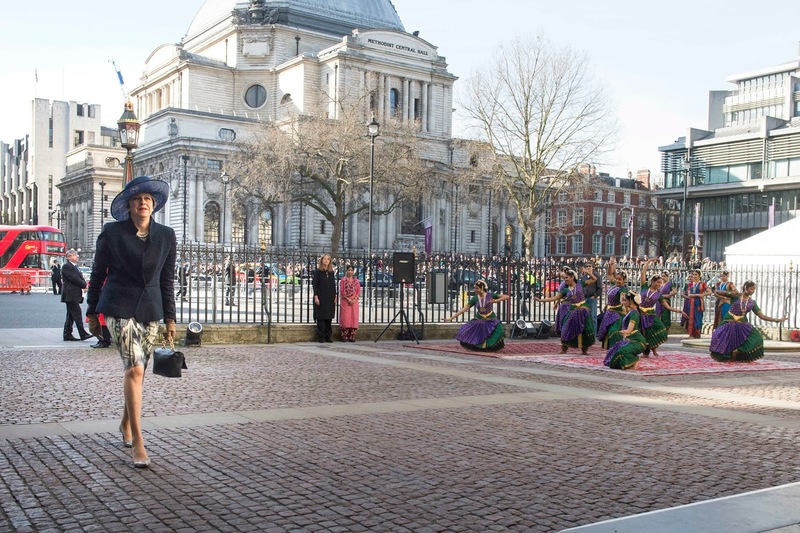 It is a fantastically striking design, and May wore it with her usual panache this week, using it to accessorise a navy Escada suit for a busy day in the Commons and at Downing Street. 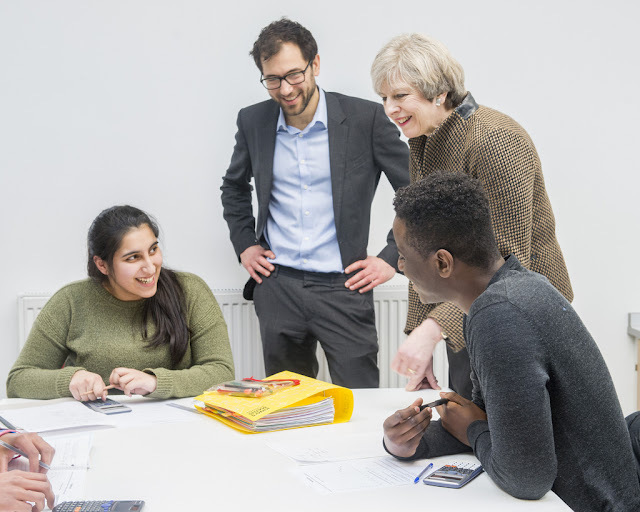 The scarf has similarities to Hermes (another of May's favourite,) but I was so pleased to see the Prime Minister again championing an up and coming young British designer. 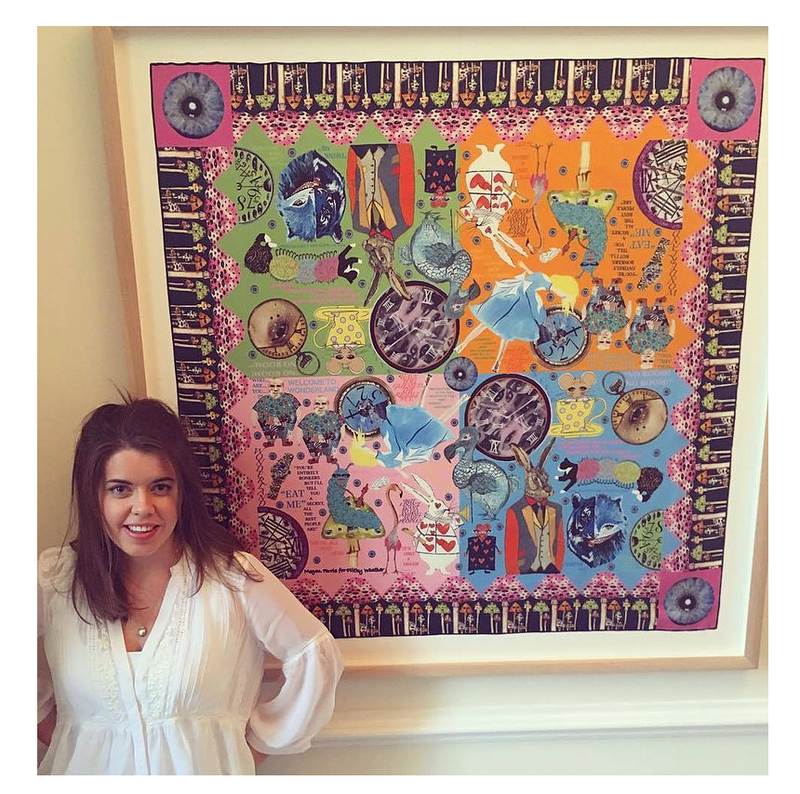 Ferris herself was excited to see one of her scarves being worn by May, and I caught up with her over the weekend to chat about what inspires her as a designer and her thought on the Prime Minister's support. Why did you choose to study printed textiles? My earlier work was more three dimensional but I realised it was the patterns and intricate details of my sculptures and installations that most intrigued me. Printed textiles encompasses everything that I enjoy about design so it was the perfect pathway for me. It also involves a huge variety of techniques and processes and I was keen to develop my skills. The main thing I enjoy about print is that each time you need to put something into repeat it’s different because the imagery always behaves in a different way when repeated so you have to manipulate the layout to make it work as an all over repeated design. What are the inspirations behind your designs? 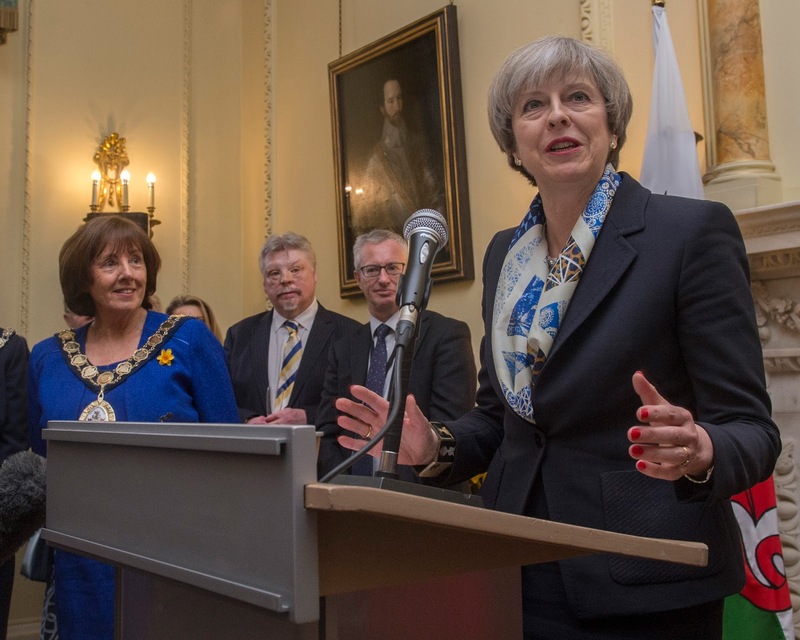 ‘Tavira’ which was worn by Theresa May was inspired by the the blue and white azulejo tiles and architecture from the town of ‘Tavira’, Portugal. The town has many churches and their interior walls are tiled with beautiful blue and white hand painted murals. 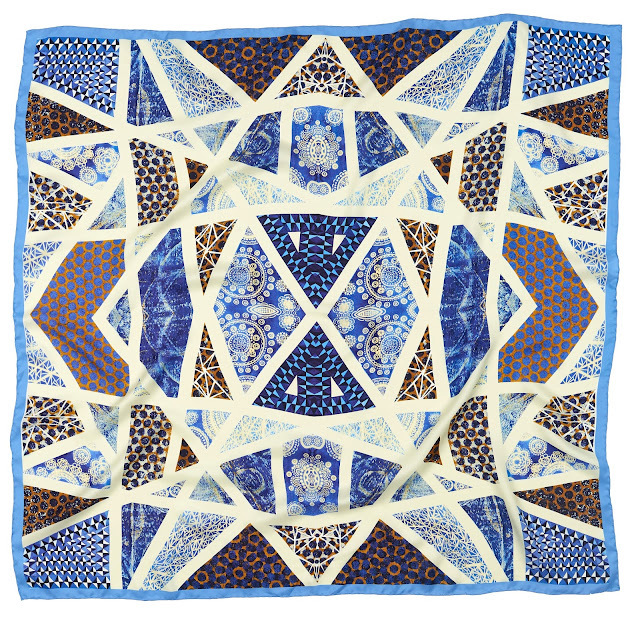 My design takes an abstract perspective on Portuguese architecture and ceramics to create my geometric blue and cream scarf. I have just started my Final Major Project for my degree where I am looking at ‘The Garden of Earthly Delights’ by Hieronymous Bosch. Recently I have taken an interest in taxidermy, anatomy and surrealism. People who have influenced my work include Alexander McQueen, Polly Morgan, Salvador Dali, and Kandinsky to name a few. I enjoy black and white film photography which has inspired some of my work and I love cinematography. How do you create your scarves? Each design is unique and I have used a variety of different methods to create each one, some are collaged, scanned objects, hand drawn or painted. I then send a digital artwork file to my lovely manufacturers in Macclesfield. I always get a test scarf printed first to check the colours are accurate. I chose to use digital printing to conserve water and reduce dye waste and it also allows me to create highly detailed designs which would not be possible through screen printing. The silk twill I use has no optical brightener, no chemical treatments and has been sourced ethically. The printing machines used are rebuilt from retrofitted technology from obsolete equipment to reduce land fill. None of the printing inks are environmentally damaging and all print machinery inks are recycled. The fabric is steamed and washed using high pressure jets rather than tanks of fresh water to reduce water waste. My scarves are then hand rolled in London by artisans using a traditional method. What are the highlights and challenges in your work? Researching for a new project is always very exciting, with a vast amount of resources available in archives, museums and libraries, it’s always stimulating finding new material to inspire me. My main highlight would be the design process. I really enjoy the challenge of putting a design together, it’s like doing an evolving jigsaw. One of the main challenges I think is trying to think sideways and create thought provoking and standout prints whilst still appealing to peoples’ taste. Where do you source patterns? I create my own patterns so I either draw, paint or collage from a range of materials such as books, photographs, films and then I work with my drawings digitally or by hand to find a suitable layout. I have mirrored most of my scarf designs but I use a range of repeat methods for my other fabric designs. What is your best selling design? Botanicals is my best seller currently. The design was inspired by Damian Hirst’s “It’s a Wonderful World”. I picked flowers and then arranged them digitally to form a kaleidoscope pattern. I spent a particularly long time on this design to ensure each flower was carefully cut out and mirrored the way I wanted, the colours are lovely too. Why is it important to create your scarves in the UK? A sustainable future is a really big consideration for me, I wanted my scarves to be made in England to reduce my carbon footprint. As a small business myself, I think it’s very important to support local businesses, local crafts and trades. I produce limited runs to reduce fabric waste and ensure exclusivity. What are your thoughts on the future of the British fashion industry? For the last two years I have been studying design futures and it’s enlightened me to some amazing new technologies and social innovations that are being developed. 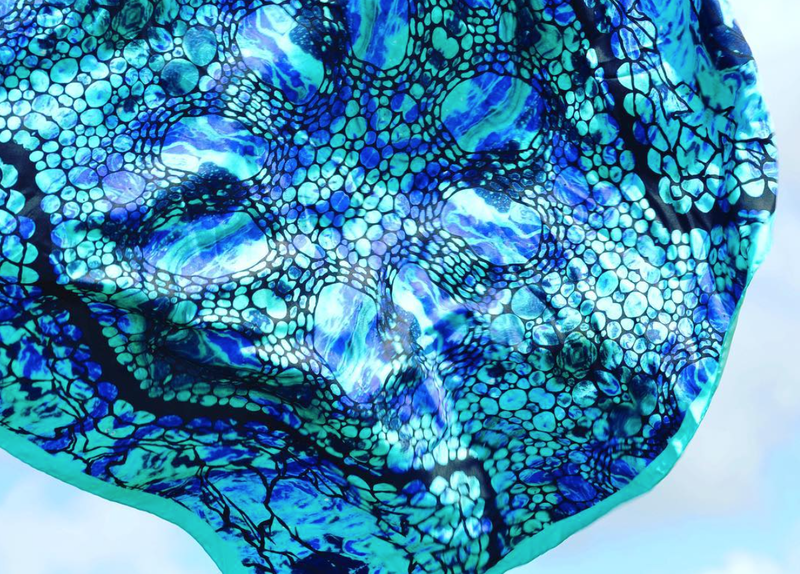 Smart and interactive textiles are particularly fascinating to me and I love Suzanne Lee’s ‘BioCouture’ fabrics which are grown using bacteria. I believe that there is huge scope with the innovative technologies available for some amazing new fabrics to be developed if engineers, scientists and textile designers collaborate. Overconsumption is a huge issue and as designers I think we have a responsibility to encourage people to invest in buying fewer better quality items. Nike and Patagonia are particularly inspiring to me. Both use some revolutionary technologies to create their products and show an excellent commitment to sustainable practices. What are your plans for your design business? I am hoping to expand my range of products. I have a few ideas in the pipeline and some exciting projects coming up. I am hoping to learn how to pattern cut when I finish my degree so that I can translate my prints into garments. I am very interested in sustainable fashion and I would like to make my brand as low impact as possible so in the future I hope to look for ways in which I can do so right through the production line. Find out more about Megan's designs here. I love my Barbour jacket. The motorcycle style in black is the most versatile coat I've purchased, perfect for keeping warm in the unpredictable British weather and the easiest coat to take away on business trips. 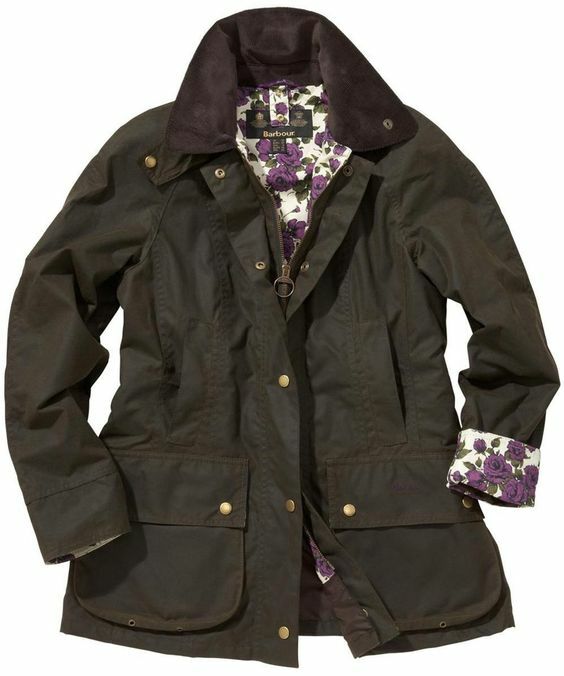 As it comes up to its four year birthday, I've found my eye looking at other Barbour jackets to add to my collection. 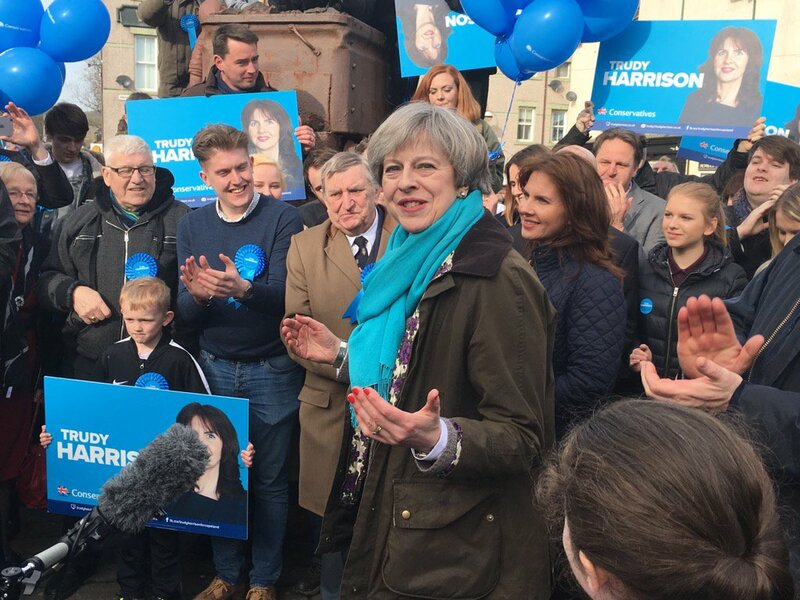 Our favourite political fashionista Theresa May is also a fan of Barbour, and she has been wearing the Beadnell style pretty frequently. From campaigning in her constituency to attending church, and most recently to celebrate the Conservative by-election victory in Copeland, May's Barbour is never far from her side. The PM owns the Beadnell style in traditional olive. But in true Theresa style, the lining is completely chic, and styled with the Liberty print in Purple Rose! Whilst they don't make this particular design any more, there are some great alternative Liberty print versions available, including this black design with the Ros print. What's your favourite style of Barbour jacket?